"Marquis is highly regarded by the world yachting community because it is the only yacht that combines superior Italian yacht design with unsurpassed American yacht engineering and construction." Marquis Yachts USA of Pulaski, Wisconsin, offers eleven models of Motor Yachts and Sport Yachts for 2012 ranging from forty-three to seventy-two feet. 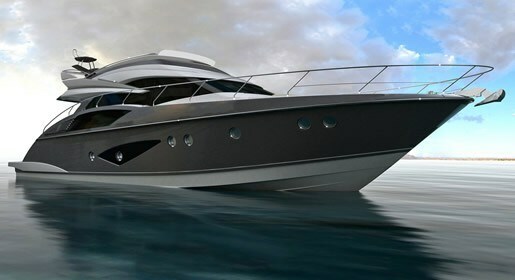 The new 630 Sport Yacht is so new it was unavailable for the Toronto International Boat Show in January and instead, made its introduction in February at the Miami International Boat Show. It is impossible to do descriptive justice to an almost sixty-six foot, seventeen-foot beam, tri-level, multi-stateroom yacht with optional crew quarters plus several optional interior layouts in a short review like this and so a cursory overview will have to suffice. Welcoming you to the main deck comprising the cockpit, salon, pilothouse and foredeck is a pantographic, hydraulically-actuated massive swim platform which moves out and down by remote control. The 114 square-foot (10.5 m²) cockpit offers eight storage lockers, transom lounge with cover, and access to the bridge stairway. Moving forward through the sliding, stainless steel-framed, convex neutral density glass with mirrored exterior entrance door with interior sliding screen to the salon, you will find opulence and comfort in the two recliner plus two swivel chairs plus a sofa, all Ultraleather® covered. Entertainment is provided by a Sony® home theatre system and a 42" TV. 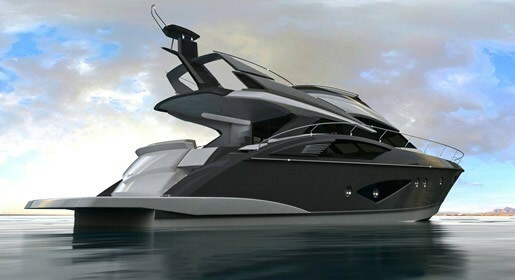 In Marquis' words, "Entertaining is made simple with this forward-thinking design, featuring an integrated lower helm station, galley, salon, cockpit, and swim deck." The lower helm with a six-way electrically adjustable seat resides ahead of the salon along with a curved lounge and here you choose galley up with dinette at this level or down four steps to the lower level. The galley appliances are all brushed stainless steel and countertops are granite. The lower deck comprises all staterooms, heads, crew quarters, and mechanical equipment. The master stateroom with master head lies approximately mid-ship and stretches beam-to-beam with soft opulent solid cherry throughout enhanced with Italian marble inlay, designer décor, and adjustable soft indirect lighting. The berth is a "California King" with pillow-top, inner-sprung mattress. There is a sofa here and two walk-in closets. The head has marble flooring, marble countertop vanity with "his" and "hers" sinks and a separate walk-in tiled shower. A forward private VIP stateroom has a queen-size island berth with designer décor, surround shelves, two nightstands, six storage cabinets, and two full height, cedar-lined, carpeted wardrobe lockers with mirrored doors. The attached private VIP head has marble flooring, marble countertop vanity and separate shower stall. A starboard side guest stateroom has two twin berths with private guest head access. This guest head also has a separate shower stall. To port is a smaller optional fourth stateroom. Aft crew quarters comes standard as a fiberglass storage module with dual access from the boarding platform and the engine room and is optionally equipped with crew accommodations with or without a separate head and its own entertainment system. The bridge deck (fly bridge) on the 630 is huge and accommodating with three available layouts, all three of which offer a large U-shaped lounge, wet bar plus a separate curved bar, table and welded aluminum electronics arch. Two additional lounges and/or seating options are available as is a bridge hardtop with or without a retractable canvas top section. Additional wet bar options and a grill are also available. The Marquis 630 Sport Yacht comes standard with twin Volvo Penta™ IPS3, 900 hp diesels with pod drives with four, 30" counter-rotating NiBral propellers and joystick control system, electronic Fly By Wire steering with emergency mechanical bypass, a total of eleven batteries, four battery chargers, 3-zone, 86,000 BTU air conditioning/heating, and a 23kW Kohler® diesel generator with sound shield. Available options which include, among a multitude of personal choices, navigation electronics and interior and exterior amenities, décor packages, etc. fill an entire page. 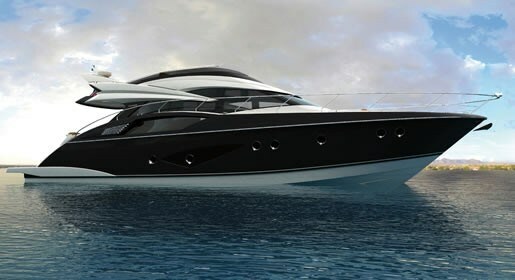 This review does not adequately describe the opulent luxury and spacious accommodation of the Marquis 630 Sport Yacht. You must review it in person in order to truly appreciate it.